There are a number of different options for emergency cooking. 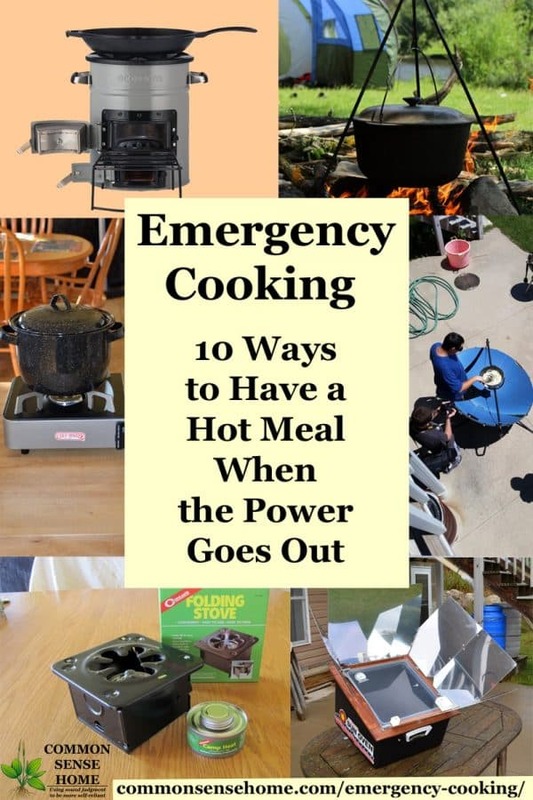 In this post we'll cover everything from simple heating to large scale cooking for emergency situations. Before we get started: For those who are new to preparedness, using an emergency generator to power an electric stove or microwave is not a good allocation of resources. Stoves and microwaves use a lot of power in a short amount of time. It's much more practical to use other means to heat/cook your food. Always be careful to use options inside or outside as appropriate. Don't end up asphyxiated from cooking fuel fumes or burn your house down while trying to make a hot meal. Make sure you have cooking equipment suitable for your heating option of choice. Practice with your method(s) of choice until you can reliably produce a meal. 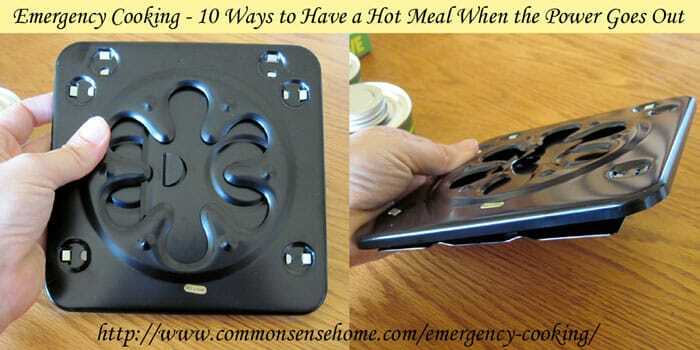 Don't use it for the first time in an emergency (except for the “heat themselves” food items). One of the simplest methods of heating food without power is food packaging with built in heating elements. A twist, snap or shake triggers a chemical reaction in some portion of the packaging (for instance, twisting the bottom of a soup container). This chemical reaction produces enough heat to warm the contents of the container. Some MREs (Meals Ready to Eat) include this option in their packaging. To the best of my knowledge, no natural/organic options at this time. Another variation on this theme is the Portable Camping Cooking Bag, which allows you to heat the food of your choice in a chemically heated pouch. The Magic Cup heating unit will heat a beverage or soup in a cup sized container. Safe inside or out. These tiny folding stoves fold flat for storage, and are basically designed to give you a larger, flatter surface to cook on that fits over the top of a small, round fuel container (Sterno or liquid canned fuel). Heating output is limited, so this option is better for warming or reheating than cooking an entire meal from scratch. Safe inside or out, as long as there is some ventilation. Sterno cans are used for hours on buffets. These tiny stoves are fold up very small, so they would be good for an emergency pack or bug out bag. Similar is size to a larger laptop (but thicker), these portable butane stoves can go just about anywhere. They generate enough heat to do “real” cooking, but the butane canisters are fairly expensive and hold a limited amount of fuel. Better for short term emergency cooking inside for those with limited space. I first read about these in the book Apocalypse Chow: How to Eat Well When the Power Goes Out. We used our butane stove while we waited for a replacement stove to be hooked up in our kitchen. it worked very well for stove top cooking, including boiling water. For a small stove it puts out a surprising amount of heat. I demonstrate how to use it in the video below. Your standard propane grill can do double duty as a summer party mainstay and an emergency backup stove. The positive on this one is that many people already have these stoves and know how to use them. The down side is that they are not safe to use indoors and can be quite unpleasant, if not impossible, to sue during really nasty weather, such as blizzards or hurricanes. Keep a spare propane container on hand. Note: Always store your propane cylinder outside and upright in a protected location – not inside a house or garage or near combustible materials. Avoid conditions where it will rust, potentially causing cylinder failure. See Storing Propane Cylinders for more information. Propane will store indefinitely, as long as the seals and the storage take remain intact. Less common than they used to be, charcoal grills are still used by some – including yours truly. They have the same limitations as propane grills, and may be even less practical for small amounts of cooking or long. slow cooking. If you have one, do invest in a cylindrical chimney starter to get your briquettes lit without starter fluid. Much less expensive, plus you skip the extra dose of chemicals. Plan for extra time (20-3o minutes) for the grill to get up to temp for cooking. If you've ever watched a “survival” show with average people, or a cooking show competition where they forced people to cook over open flames, or better yet, you've done it yourself, you know there is some skill involved with open fire cooking. There's no knob to turn or button to push to adjust the temperature. It's quite easy to burn food on the outside and/or leave them cold in the center. If you plan to cook over an open fire during emergencies (or even if you don't), it's a good idea to practice with this technique in a low stress situation, like camping or screwing around in your backyard. You need fireproof cookware (or aluminum foil or large leaves, depending on your technique). For more info, see Cooking With Cast Iron—How And Why To Get Started. There are new products on the market that can be used with several different fuels, such as the Volcano Portable Stove, which works with charcoal, propane or wood. Fairly small and portable (Weight = 19lbs, Footprint when open. 19.5″ diameter circle), this would be a nice option to have on hand to take advantage of whatever fuel you have available. Another interesting option that I just spotted on Amazon.com is the EcoZoom Stove, which can use wood, biomass, or charcoal. You can check out my review here – Ecozoom Rocket Stove Review – Portable Cooking with Multiple Fuels. These big, high powered burners can crank out a lot of heat. In addition to the more common used such as deep frying turkeys, fish boils and making enormous pots of soup (known as booyah in our area), they can also be used to heat water for laundry or bathing. Some people also use them for outdoor canning, but it should be noted that the intense, point source heat may warp the bottom of your canner. Can also be used to heat water for scalding chickens for processing. A better option in warmer, sunnier climates, solar cookers can be used to make everything from baked goods to main dishes. Designs range from a tire tube with a piece of plexiglass over the top to heavy duty commercial cookers and solar distillers. Solar heat can also be used to dry foods. Check out “What's the Best Solar Cooker?“, “Getting Started with Solar Cooking” and “Getting Started with Home Food Drying” for more information. My grandmothers used wood cook stoves and some of my homesteading friends still do. Look for these beauties where off-the-grid folks such as Amish and Mennonites shop, either online or in person if you are lucky enough to have a community nearby. Like any wood burning appliance, these stove require proper ventilation and safety precautions, but they have served many people faithfully for years. Some also come equipped with water reservoirs for heating water. The built in oven in my masonry stove has been a little more difficult to master, as you can't burn more wood to adjust the temperature because the oven is part of the combustion chamber. While the oven does give tasty smoky goodness to the things I cooked in it, I would not want to rely on it for frequent cooking. 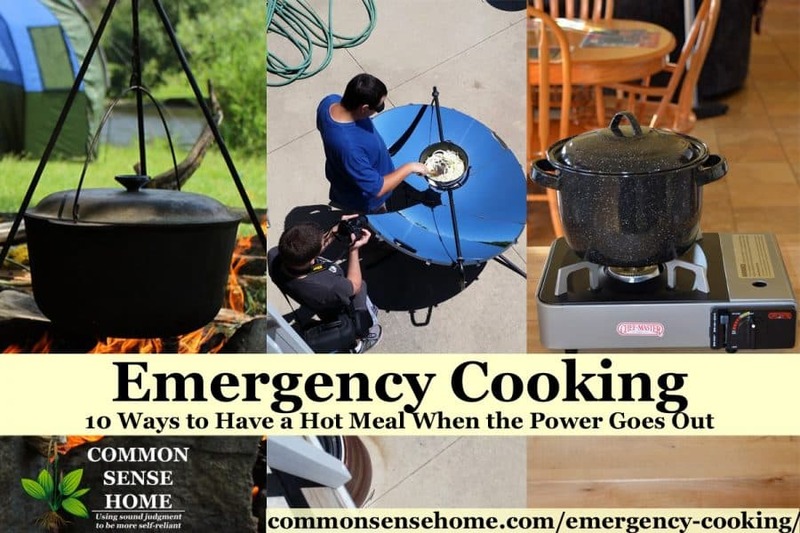 Whichever option you choose for emergency food preparation, keep in mind that fully cooked foods that just need to be reheated will be much easier to “heat and eat” than whole, non-cooked foods. For instance, canned beans would be much easier to use than dried beans, because they don't require additional water, soaking time or extended cooking time. Make sure you have people powered tools instead of electric tools for cooking. Electric can openers do not work when the power is out. To be honest, for many kitchen tasks I prefer using hand tools all the time because they are quieter and more compact. Make sure you have pots and utensils that can be used with your cooking option of choice. Fires and grills can be much hotter than your average stove burner. (No plastic spatulas, please.) Long handles and hot pads or ove-gloves, or at least a folded rag to grab hot handles are a must. Cast iron cookware is a workhorse. Practice, practice, practice with your cooking option of choice. At the very least, practice making the quick to fix foods that would be emergency fare. If you are truly inexperienced in the kitchen, just practice cooking – any cooking. Like any skill, food preparation gets easier the more you do it. Practice cooking with only minimal equipment. Go camping, have backyard cookouts – cook a meal on the beach. Anything you can do to mimic cooking without your stove and all your regular “stuff” will make things so much easier if you end up without power. Repetition builds muscle memory so that even in difficult times, your body will remember when your brain may be distracted. I hope you found this post useful and much appreciate your Likes, Shares, Stumbles and Pins. Feel free to comment and share your favorite off grid cooking option or any questions you may have and I'll do my best to help. Originally posted in 2013, updated 2017.
a few…3,4,5,6,8,10! LOL! I got cooking covered! I am experimenting with a Coleman folding camp oven set on top of my woodstove now. Trying to get it over 300 deg…. I have no idea offhand. It’s something I picked up at an estate sale. I’ll have to check and see if I can find identifying markings. Plow and Hearth has several great cast iron pots for use on wood stoves, etc. One looks like the one pictured. We have plenty of exterior methods of heating food (a couple of campstoves, a firepit and a grill) and have done a lot of cooking on them as we love the outdoors but we don’t have anything for indoors yet and I would like to get something since if we lose our power in a blizzard it might not be very fun to go cook outdoors or even in the garage with the windows open. This summer when camping the stove we were using acted up and my inlaws bought what you have as option 2 for us to use. We were not at all impressed. Maybe we didn’t use it right but it always wanted to burn right in the middle of the pan and then do practically nothing at all anywhere else. I really like the look of your woodstove and oven. We will be building a new home, Lord willing, next year and were thinking of putting a fireplace in (as we like that look) but what you have is also very pretty but I am sure quite a bit more practical. 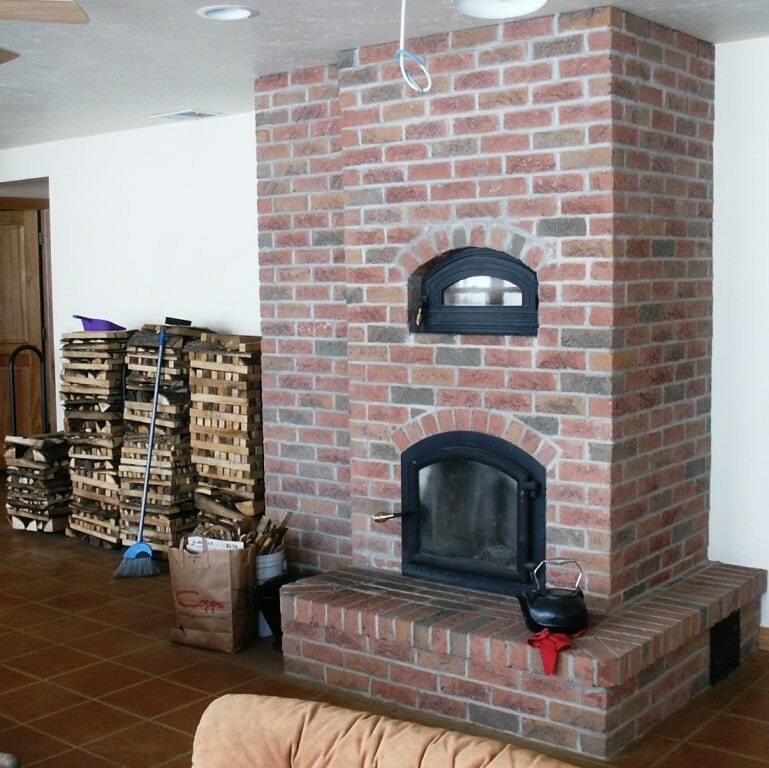 To be completely honest, I have mixed feelings on the masonry stove. It gives a wonderful slow heat, which we love, but it was expensive. Also, since we don’t have wood on our property, we have to buy wood. Thankfully, my brother-in-law has a saw mill, and we can usually purchase their scrap lumber, but he is thinking about retiring. The stove requires small diameter wood (no larger than 4″ diameter, smaller is better) so that it burns with a hot, quick fire. This is hard to find in quantity, unless you buy and split. (He makes wooden stakes, so his scraps are great for us.) I wish we had been able to afford geothermal, which can do heating and cooling. Try a Coleman Tri-fuel stove or one of their LP units. Great for camping and wonderful for blizzards! Been there! You didn’t mention the actual fireplace to cook food. I use a cast iron dutch oven and can make all sorts of food in it. Just set it to the side in the fireplace, rake coals around it and on the top. There is also a great number of fireplace gadgets for cooking as well. Very few people have open fireplaces anymore because of building codes and such, but that’s certainly a good option if you have one available. I have several propane options (for outdoor use) that we use in our tailgating. One is a propane crockpot, and the other is just a single burner that sits on a small propane bottle. Thanks for sharing. I didn’t realize they made propane crockpots. Very handy. Propane Crock Pot? Where can I find one of there???? 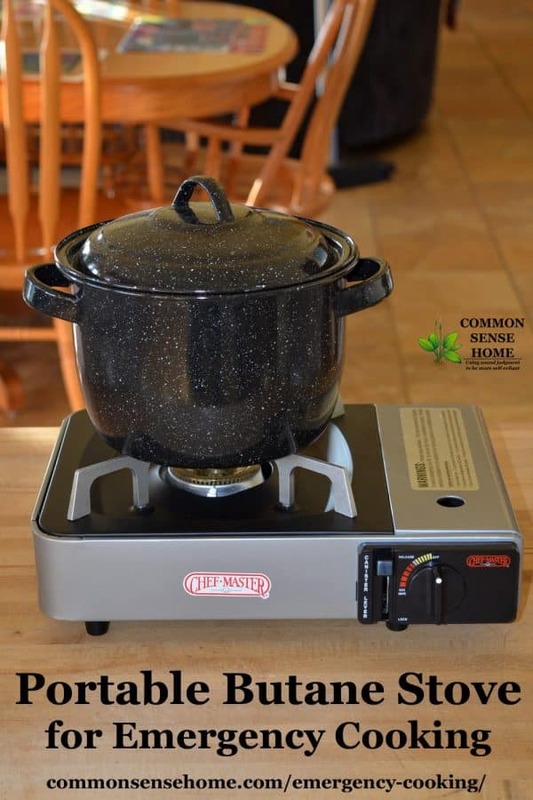 All-in-1 Stove/Grill/Slow Cooker/Skillet Propane-Powered Cooking System can be used with a crockpot add on (this is the add on – Max Stock Pot/Cooker For All In One Cooking System). Thanks! I will test it out in the ice shack next year! I ordered mine from Amazon. It’s a Coleman Heat n Serve. Sharing this to our FB page today! Good stuff! I enjoy the webpage and have been following all tips and ideas which is very helpful. I do canning from my garden and enjoy in my winter season. It save money,time and energy. Pop can stove. Easily made from a soda can. You Tube. Heats up great and is extremely small. Backpack item. Different fuels used for different models made. One of my favorites is the Wonder Oven. After you have brought your food up to boiling or to a certain temperature, then it can go into the Wonder Oven which insulates and finishes the baking / cooking process. Think of it as a slow cooker without electricity. They used to call these Hay Box ovens… some people use a pillow cushion others use an insulated cooler for the same effect. For boiling water – hands down, I prefer the Kelly Kettle! Love mine!!!! Cindy, I read about the Wonder Oven, and saw some concerns about it not maintaining a high enough temperature to avoid breeding bacteria. Did you have any thoughts on that? I haven’t tried the Kelly Kettle, but should check it out. I have a solo stove. It work great using a bunch of small twigs and small chunks of wood. They have an alcohol can yet I have never used it. Here is a link to their site. I have the stove and pots not to rub it in. http://www.solostove.com/#oid=1073_1_text_2. I had one of the folding stove like you have shown but it got lost long ago. I carried it during a trek on the Appellation trail when I got out of the USMC back in 1977. Looks like a handy little stove for small amounts of cooking. Small to medium sized fondue pots – the kind that use a tealight – are also good for heating up a jar of soup or water to drink. They are also pretty cheap at second hand stores. They do involve open flame, but as long as they are attended to, and put on a stable heat proof surface they do work well. That’s a good idea! Thanks for sharing. I see those all the time at the thrift shop. I spent a summer working in Alaska a few years ago, installing satellite internet at remote schools. We “camped out” at the school after the work was done each day, then climbed aboard a bush plane that met us the next morning with a new load of equipment, and flew us to the next village to install another internet system. We had to carry everything with us, including food and implements, and I was pleasantly surprised at how tasty the freeze dried food from Mountain House was. All you need is a way to boil some water, pour it in, stir it up, and wait about five minutes. Yum! It’s a little pricey, depending on where you get it, and can be a bit high in sodium, but for emergency fare, it’s hard to beat. I only found one entree that I didn’t care for (the beef stew), but the rest were amazingly good, and they even have a few breakfast choices that are very good. The packages are usually labeled as “2 or 2.5 servings”, and I guess two people could share, but a full-sized feller with a good appetite will probably be inclined to eat the whole package himself. Amazon sells it in “12 pouches – 29 serving” collections, but that equates to really only 12 meals for a hungry man or growing teenage boy. The bonus is that you can store it for a good long time. I agree that Mountain House are some of the better freeze dried meals that we’ve tried – good enough that we stocked up on some “just in case”. I think your portion comments are spot on, too. The boys could easily polish off a pouch by themselves if allowed to do so. I have an old metal bucket I picked up at a yard sale that kept me fed warm meals for about 3 weeks during the 2009 ice storm. I drilled a few holes in the bottom to aid ventilation and use an old cookie cooling tray on the top. In that 3 week [without power] period I used Canned Heat, Charcoal, Wood and even, at one point, a bunch of old bills that would normally have gone through the shredder! There is also a Stive called biolite. Laurie, this is great information; thanks for providing it. My husband was surprised it could be used indoors. I didn’t misunderstand did I? Also, would the Chef Master portable butane stove be substantial enough to handle a fully loaded All American 915 Canner which holds 7 qt or 10 pt jars? Do you think the heat can be regulated enough to keep it at the right pressure? Our stove is non-functioning, and we’re using hot plates, but they do not work well with a canner. It takes forever to get it up to pressure, greatly increasing the time necessary for each run. Thanks for your help. You’re welcome, Karen. The little butane stove is indeed rated for indoor use. Off-gassing during the burn time would likely be similar to what you’d find from a gas stove burner – not much. As I mentioned, we used it for several days while we were without a regular stove. There was no detectable odor. I don’t think the little butane stove would be up to handling a fully laden canner. Boiling a few quarts of water and other light duty cooking, yes, but canning takes a lot of energy over a long period of time. I know people have canned on the big outdoor propane stoves, but that’s a bigger investment. So glad I found this helpful site ! so much in a little time. I want to build a solar oven! I have a tiny woodstove, but need more options! I dont want to buy a bunch of sterno to store. I have some but dont want to go boom! suggestions please! Thanks!! I’m not sure I understand the question. There are a number of options listed in the post, so it’s a matter of finding which one is a best fit for you. Sterno won’t go boom, but it will dry out over time. There are ideas for simple solar ovens you can build in the post “Getting Started with Solar Cooking – DIY Solar Cooker Ideas, Printable Cooking Guide“. Here in Modesto California we have a lot of triple digits days, sometimes a week or more in a row. Heating up the kitchen only adds to the misery and makes the air conditioning work harder. I “cook” a lot on the dash of my van. I have used a pint canning jar and a freezer bag laid in a dark baking pan. One recipe was a Italian rice dish including a small can of mushrooms including the juice, a small can of tomato sauce, one fourth teaspoon of Italian seasoning, one third cup of instant rice. The jar took thirty minutes to heat up and solidly filled the jar. A quart jar may work better. The freezer bag took only twenty minutes to cook. It was not as dense as the stuff in the jar. I put the bag in a dark pan to reflect the heat back into it. I also did it in case the bag leaked. I didn’t want to have to explain to my mechanic why trice, mushrooms and tomato sauce was in my vans air conditioning. A vehicle makes a great solar oven. When we moved to the mountains in Colorado in 1978, we had no utilities at all (electric or water) except propane to run the kitchen stove and a Servel refrigerator and its tiny freezer. Since it was summertime, I found some cinder blocks and took one shelf-rack out of the gas-stove oven to build a fire pit in the front yard, setting cast iron frying pans on the rack. I used aspen and pine sticks from our woods to fuel it and quickly learned how to cook over an open fire. My family had never done any camping in the woods, or open-fire cooking, when I was growing up, so I had to learn a LOT of new skills! When we hooked up an OLD upright parlor stove and burned wood and coal in it, I learned to heat water on it (we were hauling water in an old metal 10-gallon milk can, so I had to make it last as long as possible! ), and eventually learned to cook on a wood stove – we later got a bigger, more modern King heater that had a top lid that opened so I could cook an entire meal on it. I loved that stove, and wish I still had it! We’re now in upstate New York and have a non-electric propane kitchen stove (everything on it works without electricity), a small Jotul wood-burning stove to warm the house (too small to do a really good job in bitter cold), and this spring I purchased a Sun Oven. It sat in its unopened box for several months before I finally got up the courage to try it – all I’ve done so far is dehydrate wildcrafted herbs, but at least I’m getting my feet wet! Now, if the weather would just cooperate – it requires enough sun to cast a good shadow, and we’re getting rain at frequent intervals, so there’s very little sunshine to work with. I also ordered their little “cloudy-day” stove and a dozen fuel cakes for it, but that will be for emergencies only. I love the fact that the Sun Oven people have been sharing their stoves in needy countries, and even make a community-sized model for schools and/or villages to bake bread in, to sell for their own use as well as income. (www.sunoven.com) It will also boil water, and can be used with the included reusable Water Pasteurization Indicator to pasteurize water for safe consumption. The Sun Oven may seem a bit pricey ($300 on sale, to $500 not on sale, including all the extras that come with it), but a good chunk of the price goes to this humanitarian work, which I gladly support! It also seems to work really well. The first time I took it out of the box and set it up, aimed at the sun, the closed box went to 200 F. in about 10 minutes, and to 300 F. in another 5 or 10 minutes – and the glass lid was still cool to the touch, but the black box was HOT! It’s very impressive to sit and watch the thermometer rise that fast, just by using the sun. Because the heat is uniform inside the box/oven, there are no hot-spots to burn food, so I’m going to try warming cold leftovers in it whenever we get some sunshine this week. Thanks for your informative posts – I’m learning some new things, and refreshing memories of stuff I taught myself to do through the years. Keep up the good work, and may God always bless you and yours. Thanks for sharing your story, Becky. We’ve had a lot of cloudy weather lately, too. The Sun Ovens are also built to last a lifetime, so they’re not something that’s going to need replacing in a few years. It’s a long term investment.